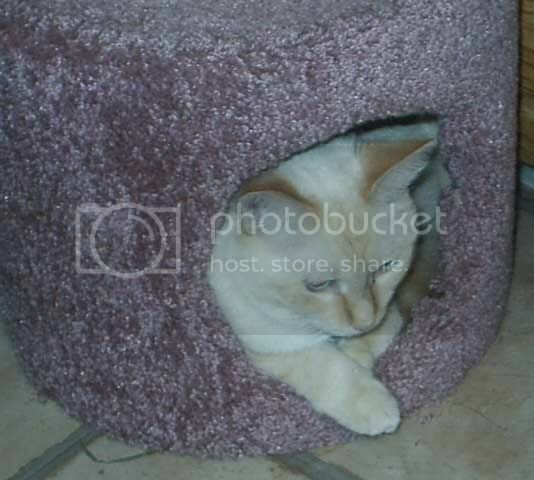 Was just wondering if any of u have Siamese cats, I have 7 Siamese whom I am nuts about and I believe Siamese r very intelligent and talkative...so was thinking if we can share our stories about them??? I've got two cats, but neither of 'em are Siamese. I've heard that Siamese are supposed to be pretty smart, though. But if you decide to include non-Siamese, I'd be more than willing to swap stories! 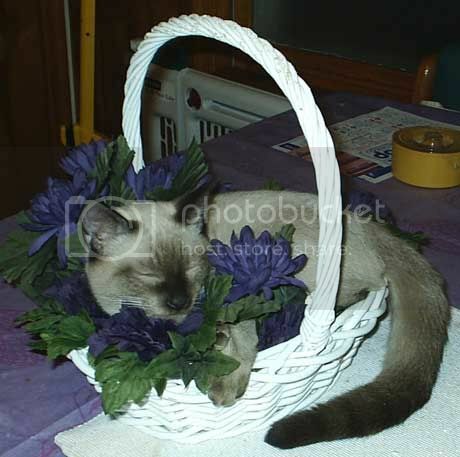 I have one siamese, but he is mixed with tabby. OMG he is sooooo arrogant and a loner..lol but he can be very sweet sometimes.. he don't really like to be touch but he is really friendly with stranger especially guys.. I wonder??? LOL...My two cats are sweet, each in their own way, but they can do arrogant when the mood hits! Let's try this again. Gotta love it when you hit the X by mistake. We don't have Siamese but we do have 2 Tonkinese. One's a Chocolate Tonk and the other is a Flame Point. This is Blizzard, she's one of our blind kitties. And this is Tori. His light fur is now as dark as the end of his tail. (((((((( DLC)))))))) They are adorable. Bles you & ((((((((( Tam ))))))))))) for all you do. There is a special place for you.